Oh Bryan are a Dublin based alternative rock band consisting of Stephen O’Brien, Shane Power and Billy Campbell. They are joined by Gonzalo Gutiérrez on drums for live shows. Since forming in late 2016, they have grown from strength to strength. 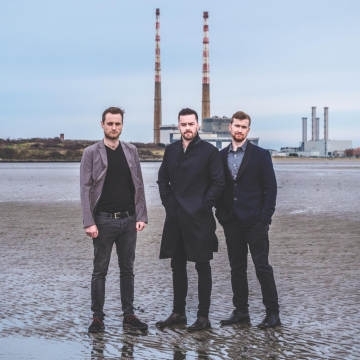 After releasing their debut EP “Rewind” at the end of 2017 to a sold out show in Whelan’s, they have gone on to support on the “Feel No Shame” tour at some of the country’s top venues, namely the INEC in Killarney and Wexford’s National Opera House. The band have also shared other huge stages with great Irish artists such as Little Hours, The Blizzards and Chasing Abbey. Oh Bryan pride themselves on their live performance and are able to provide either a three-piece acoustic set or a four piece full rock show, both teeming with energy. In the past 12 months they have released two self-made music videos and multiple lyric videos. They are doing particularly well on Spotify where they have over 400,000 streams. In 2018, the band released new single “The Little Things” followed by their latest release in 2019 “It’s Not The Same” a deeply personal track which was written in memory of a friend who passed away. They are currently in studio, working on more new music for a second EP and two more music videos set for release in 2019.